Every so often I come across a picture book that is truly universal in nature because the story is relevant for everyone. Today's book is just such a title, and I intend to keep it on hand for those days when I am in a hurry to fly. When we come into the world, each one of us has to figure out how we want to face life’s challenges. Often figuring this out is a complicated business that takes time. In this extraordinary book the author explores the idea that the challenges that we face all the way through life are part of a grand journey. In her artwork she follows what a little baby bird does after it comes out if its egg. We see scenes from the little bird’s life, scenes that are often sweetly funny. The text that accompanies these scenes introduces ideas that are universal in nature. Just like the little bird, whose little flappy wings are not big enough for flight, we have to accept that “Having wings does not necessarily mean we can fly…yet!” We have a lot of learning to do before we can soar, and that is perfectly all right. With wonderfully minimal illustrations and words of wisdom that are timeless, this is a book readers of all ages will be able to appreciate. I have only been fishing a few times. My husband and I went fishing in the Chesapeake Bay and brought home pounds of bluefish and striped bass and sea trout. The expeditions were a lot of fun, often full of excitement and quite exhausting. In today's poetry title you will meet two children and their dad who go fishing on a lake and who have an day that they will probably never forget. Sam is excited because he is going to go fishing with his dad tomorrow. Together they go out at night to collect night crawlers. They have to “Tiptoe near and grab them quick” if they don’t want to have to play tug-o-war with the wriggling creatures. Sam gets out his tackle box, and then he finds out that what should be sacrosanct has been invaded by Lucy, his little sister. She has put her princess doll in his precious tackle box and a bunch of his stuff is missing. Where is his map and his compass? Lucy explains that she just wanted to play with his box and that his possessions are safe. To say that Sam is annoyed is an understatement and he comes up with a spell to curse his sister for meddling with his tackle box. At least he won’t have to deal with her tomorrow when he and Dad go fishing. Alas for Sam. The next morning his one-on-one time with his father is invaded by Lucy. Dad agrees that Lucy can come along on the fishing trip and there is nothing Sam can do about it. After waiting for Lucy for what feels like an age, a thrilled Lucy, Dad and a very unhappy Sam get into the car and head for the lake. Sam can hope that he will catch lots of fish and that Lucy won’t catch a thing, but this is not what happens. It doesn’t seem at all fair when Lucy, in spite of the noise she makes and the silly song she sings, catches a fish on her second cast. Surely this trip cannot get any worse? Using a variety of poetry forms, the author tells the story of a fishing trip that does not quite work out as planned. Readers will find easy to feel sorry for Sam, though the mishaps he has are rather funny. The story is told using an acrostic poem, a list poem, a concrete poem, a narrative poem, and many other kinds of poetry forms. At the back of the book the author provides her readers with more information about the poetry forms that were used in the book. Imagine if you can what it would be like if you were on a dragon's menu. It's not a pleasant thing to think about is it? Now try to figure out how you would convince said dragon not to eat you. Hmmmmm. It's not easy is it? Just in case you find yourself in this situation one day, I suggest you read today's picture book for inspiration. Once a year the great dragon wakes up hungry and he makes the earth shake and tremble. When this happens, the people in the village know that it is time to give the dragon a princess to eat. One year the dragon wakes up and the villagers realize that they have a problem; they have no princess to give to the dragon. Since they have no princess, the villagers decide that one of their children will have to be sacrificed, and by sheer bad luck Oscar’s name is the one that is picked out of the village elder’s hat. Oscar sets off up the mountain to meet the dragon in his lair. The dragon is starving and he is not pleased that he is being offered a scrawny child who will barely serve as a “teeny-weeny snack.” Oscar suggests that the dragon fatten him up so that he can be a “main course.” Since this sounds like a good idea, the dragon takes Oscar into his cave and he gets Oscar the ingredients he needs and a stove. Oscar cooks food that smells so incredible that the dragon gets hungrier than ever, but he refuses to eat any “stupid human food.” Again and again he turns down Oscar’s offer to cook the dragon a meal, and then the dragon cannot take it anymore and he finds out that human food cooked by Oscar tastes a lot better than a princess does. Who knew? In this wonderful tale we meet a very intelligent boy who just happens to be a splendid cook, and a dragon who has a very empty stomach. The tale brings together humor, colorful characters, and an unusual food-centric element, and the clever interaction between the two main characters will delight readers who have a soft spot for dragons. Poetry collections that have a theme can be a lot of fun to explore. I have reviewed a lot of books of this kind. Sometimes though one wants a book of poems where the poems are very different. Today's poetry title is just such a book. There are funny poems, thoughtful poems, nonsensical poems, and story poems. There are times in life when it is very hard to find a feeling of lightheartedness. At such times things that bring a smile to our lips are elusive, and life can start to feel rather stale and sad. Thankfully the world is full of creative people who love to bring a little light and perhaps humor into our lives. One of these people is the author of this book. The poems begin by looking at a Mope. Everyone knows one and this particular Mope seems incurable. The narrator “hoped and hoped” that “some happy thought might help her cope,” but alas all those hopes were in vain. Next we meet another person with a problem. This one has a chronic tendency to slouch. One can understand why the slouch might be tired of hearing people say “don’t slouch,” but, as the poet reminds us, it is better to heed the warning before ones back is so bent over that one has to go to the hospital and undergo painful straightening procedures. You never quite know what is going to turn up next in this book. Some of the poems make you think, some make you smile, and some make you laugh. Every single one gives you the opportunity to explore the ways in which poems make our lives richer. When I encountered my first wordless picture books I was astonished to discover that the stories in the books were often rich and magical. Children who couldn't read could enjoy the stories, and adults could marvel at the artist's skill. Today's book is a masterpiece and I know that I am going to treasure my copy for years to come. It is a non-school day and a girl is lonely and bored. Everyone in her family is busy doing something. Her mother is cooking and is on the phone; her father is working on the computer, and her sister is busy playing a game on her gaming device. Then, in her room, the girl sees a red crayon lying on the floor. She picks it up and draws a red door on her bedroom wall. Then she opens the door and runs through the doorway. On the other side of the door there is a forest. Strings of lights and pretty lanterns are hanging between the trees. A stream meanders across the forest floor and the little girl walks over to a small wooden jetty. She draws a small boat, gets into it, and floats downstream. The boat carries the little girl into a walled city where numerous elevated waterways cross this way and that. Suddenly, and without warning, the waterway she is traveling down ends in a waterfall. As she and her boat fall through the air she draws a hot air balloon, which carries her up into the clouds. The little girl is not alone in the clouds. Flying machines, large and small, fly by. As she watches, a beautiful pink bird with long tail feathers is caught in a net, placed in a bird cage, and transported to a large and rather scary looking flying machine. For some reason, the girl cannot stand by and let the people cage the bird. She has to do something. In this beautiful wordless picture book the author takes his readers on an extraordinary journey. The journey itself is fascinating, but the author adds another dimension when he has his little girl character interact with one of the stories that she sees unfolding in front of her eyes. Readers will be delighted when they see how this unusual journey ends. Fall is not far away and many of us are already experiencing cooling temperatures and rain showers. During the summer months we get very little rain here in Southern Oregon and those first showers of the fall are always welcome. In today's poetry book we take a journey through the seasons to experience rain in its many forms. Depending on the season, rain either gives us some welcome relief, or we consider it a nuisance. Depending on our mood we enjoy paddling in puddles outside or we delight in staying indoors, cozy and warm while the raindrops tap on the windows. We then move on to the gentle rains of spring that bring life with them, and the welcome showers of summer that freshen the air and offer some respite from the heat and dust. With a wonderful introduction, and a note about the haiku form, this collection of poems beautifully captures special rainy moments. I have often thought that it would be wonderful to own and run a book shop. Dog is of the same mind and in Dog Loves Books we see what happens when he opens his own book-filled shop. In Dog Loves Drawing Dog discovers that a blank book can be the starting point for a wonderful art adventure. Now Dog is back and this time he learns that counting numbers can also lead to adventures in far off places. Dog loves books and he loves to read book so much that he often reads late into the night, even though he knows that he needs to get his beauty sleep. Eventually Dog decides that it is time to set his book aside. He puts on his sleeping mask and prepares to doze off. The problem is that he cannot seem to fall asleep. Dog tries counting sheep but the sheep are not at all helpful. Maybe what Dog needs to do it to count some other kind of animal. Dog opens a book about animals and the first thing he encounters in the book is an egg. He counts “One,” and then watches as the egg cracks open. A funny looking baby dodo steps of the egg and into the world. Dog is Number One, and the dodo is Number Two, and now they have to find Number Three. Dog and the dodo walk through the book looking for Number Three, and eventually they find a sloth sitting in a tree. The sloth has three claws on each paw and so he becomes Number Three. Counting from one to three as they go, Dog, the dodo, and the three-toed sloth wander through the book looking for Number Four. By sheer good luck the three animals meet a desert camel. Since it has four legs, it is perfectly suited to be their Number Four. Not only that, but the camel assures Dog that his home in the desert is full of things that they can count. Learning how to count can be fun, if you are a little creative, and in this book Louise Yates has found a wonderfully creative way to make counting interesting. She combines tools for learning with a story that pulls the reader into Dog’s book world. As we read we cannot help wondering what is waiting for us on the next page. What new animal is Dog going to encounter, and what new adventure is he going to have? This is the third book in a series of picture books that feature Dog. Many years ago I worked on a young adult novel manuscript that was written in blank verse. When the author told me about the format my heart sank a little. I thought that the story was going to be challenging. To say the least. When I started reading I quickly came to realize that I had a gem in my hands. The book was fantastic and I learned that novels in verse can be amazing. Today's book is just such a title. Eileen Spinelli uses her considerable skill to tell a story that is sweet and timeless. Diana loves her home. She loves the fact that a wren is nesting in the wreath on the front door. Diana also loves her best friend Rose. Rose and Diana fit together like vanilla ice cream and fudge sauce. Rose never complains when Diana starts talking about stars, and when Diana works on her poems. Rose is always there when Diana needs someone to talk to. Then something happens that turns Diana’s world upside down; her father loses his job. Diana’s parents are going to have a hard time paying for their home without Dad’s wages. After Mom goes to visit her father, she comes home to announce that they are all going to move in with Grandpa. Mom and Dad won’t have to pay a mortgage if they move, and Grandpa will have someone to share his large lonely house. They are going to move away from the yellow house and from Rose. Diana is heartbroken. She will never have another friend like Rose. She will never have a house like the yellow house that she lives in and loves. She will never be happy again. Written as a series of poems, this warm, touching, and evocative story will resonate with readers of all ages. Because of her father’s bad luck, Diana is forced into a new situation, and in the process, she learns that change is not necessarily a bad thing. Sometimes it can even make life richer and more interesting. The first day of school can be nerve wracking for some children, especially if they have never been to school before. Today's wonderful picture book tells the story of Noni, who learns that school may be a little confusing at first, but it can also be a lot of fun. Noni is nervous all day long during her first day at school. She bites her nails, twirls her hair and talks too much about nothing, and when the day is over she can’t remember what she did all day. They next day Noni meets Briar, a girl from her class, on the school bus. Briar introduces Noni to some other girls. Noni can’t believe how easy it is to make friends and for a moment she stops felling nervous. Then she starts to get nervous again. What if she gets lost at school? What if she spills juice all over her clothes when she opens her juice box? Many children get nervous when they go to school for the first time. After all, there are so many things that could go wrong. In this sweet book we meet a little girl who is overwhelmed by first day of school jitters, and who makes an amazing discovery on her second day of school. Dear Readers: Welcome to this blog. As the editor and publisher of the online monthly children's book review journal, Through the Looking Glass Book Review, I come across all kinds of wonderful books, bookish people, events, and news. I created this blog in an effort to share some of my finds with you, and I hope it will make your journey in the world of children's literature more enjoyable. Every month I post reviews, interviews, articles about topics of interest, contest information, and much more. Need help with a manuscript? I am the editor for Through the Looking Glass Book Review. I started this website what seems like eons ago and now the site contains four thousand reviews. The reason why I started this site was because I wanted to provide parents, teachers, homeschoolers, and others with a free source of children's book reviews and other related information. I only write positive reviews. If I don't like a book I am sent I don't review it. On the personal side, I am the daughter of journalists and authors and though I did study zoology, I am now firmly entrenched, happily so, in the children's literature world. I live in lovely Ashland, Oregon with my husband, my daughter Elise, two dogs, two elderly cats, and two young Siamese cats who are a pair of holy terrors. When I am not working I like to ride my bike, go for walks, ski, garden, and knit. Many of us have characters fr0m children's books which we feel some connection with. I know, for my part, that when I am in an obstructive mood I am chanelling Eloise - the little girl who lives in the Plaza Hotel and who wreaks havoc wherever she goes. 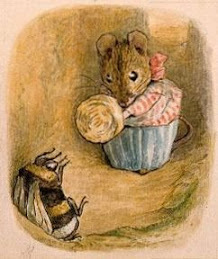 When I am in my neatfreak mode I am definately connecting with the Mrs. Tittlemouse in me. Tell us about the children's book characters which seem to reflect your personlity best. Books by Richard Scarry - I think these books taught me to read more than my teachers did.